Carl E. Waterstreet, 86, Algoma, entered eternal life at home upon his last wish surrounded by his family. 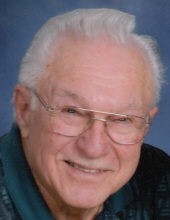 He was born March 1, 1932 in Kewaunee to the late LeRoy and Elmere (Plansky) Waterstreet. Carl left school and enlisted in the U.S. Army in July of 1949. He served four years and was stationed in Fort Riley, Kansas then Fort Richardson, Alaska and finally to Camp Atterbury in Indiana where he drove truck for the U.S. Army. After his honorable discharge he came back home and married Shirley Schneider in 1952. Carl held many jobs after he came home including the Kewaunee County Shop, Stoller Construction and then driving semi for 40 years which was his passion. He later drove school bus for Dworak Bus Service. He enjoyed taking the Algoma High School girls basketball team down to state finals in Madison. He was glad when the team brought home a Gold and Silver Ball. He also enjoyed working on snowmobiles and riding his Cam-Am Spider. Carl donated one of his kidneys for his granddaughter, Amy, which was very special for him. Carl has a bullet in his right leg which reminds him of his days working at Olsonite Corporation. After his retirement he traveled to all the 50 states. Carl is survived by his fiance'e Donna Kaye of 18 years, son Carl (Gail) Waterstreet and daughter Wanda (Al) Thomas; grandchildren Carl G. Waterstreet, Derek (Kate) Waterstreet, Brian Deprez (special friend, Nicole), Amy Deprez, JJ Thomas and Randy Thomas; great grandchildren Kayla, Conor, Kenadi and Christopher; Step children Robert (Monica) Kaye and Billy Kaye; one sister Shirley Duescher; many nieces and nephews and the Schneider relatives and friends. He was preceded in death by his wife Shirley, his parents, mother-in-law and father-in-law and one brother-in-law Don Duescher and many Schneider in-laws. Family and friends may gather at the Algoma United Methodist Church, Tuesday, May 8, 2018 from 9:00 AM until the time of services at 11:00 AM with Rev. Al Briggs officiating. Entombments at the Shrine of the Good Shepherd Mausoleum. Military Honors will be held at the church right after services have been completed. In lieu of flowers memorials may be made out to the Kidney Foundation or Amvets Post 42, Algoma. To send flowers or a remembrance gift to the family of Carl E. Waterstreet, please visit our Tribute Store. "Email Address" would like to share the life celebration of Carl E. Waterstreet. Click on the "link" to go to share a favorite memory or leave a condolence message for the family.